Richard Austin, a retail store owner from Lansdale, PA was the first player to be eliminated. He was low on chips and tried to steal a round of blinds and antes holding a marginal T8, but ended up making an ill-timed bluff when he was called by an opponent holding pocket 9’s. Neither player improved, which meant Austin was out in ninth place. He collected $16,340 in prize money. Austin’s previous poker accomplishments include two other WSOP Circuit final tables, once for second place (two years ago in this same championship event) and the other for second place. Konstantino Dimitroulakos, a Greek-born pastry chef now living in Tinton Falls, NY arrived at the final table with the shortest stack. He survived for about an hour before going bust with A8 offsuit, which lost to pocket 10’s. The final board showed QQJ28, giving Dan Witcher two pair. Dimitroulakos earned a nice payout totaling $24,511. He is on a nice run in tournaments, having cashed in three consecutive events. Feming Chan, who is self-employed and lives in Atlantic City, NJ went out on a bluff. He tried to steal pre-flop holding 96 suited. Grayson Ramage had a much bigger big stack and decided to fade the raise from the big blind with JT offsuit. Chan picked up a big draw, when the flop came J95, with two cards to Chan’s suit. But he ended up missing both the flush and straight draws, while Ramage’s top pair (J’s) held up. Chan settled for a payout which amounted to $32,681. Grayson Ramage, a college student at Bucknell University, went out on a disappointing hand when he called an all in raise by the chip leader, Chris Mitchell. Ramage had pocket Q’s. But Mitchell held pocket A’s. Neither player improved, which meant Ramage was eliminated. Ramage’s take from the prize pool came to $40,851. Among his accomplishments are a 35th place finish in the 2009 WSOP Main Event, and a 3rd place showing at the Harrah’s Atlantic City WSOPC championship last December. Jesse Chinni, a poker pro from Ellicott City, MD went bust when he moved all in with pocket 5’s, which lost to Dan Witcher’s A J. The board made a straight for Witcher. That meant Chinni had to settle for fifth place, which paid $49,021. Chinni, a 24-year-old graduate of the University of Maryland, has now made it to two WSOP Circuit final tables. Chris Klodnicki’s shot to win back to back WSOP Circuit championships in Atlantic City came to an abrupt end when he took the final table’s worst beat. Klodnicki, a poker pro who now lives in Philadelphia, PA moved all in with pocket 9’s. He was called by Dan Witcher, holding pocket’s 8’s. It looked like Klodnicki would double up, but an 8 of the river made Witcher a full house and also ejected one of the tournament’s most dangerous players. Klodnicki, a graduate of Lehigh University, who has enjoyed great success in tournament poker the last few years, collected $65,362. Video: Short interview with Chris Klodnicki, moments after his seventh place finish. Dan Witcher, from Mount Pleasant, SC battled three-handed for nearly four hours before he busted out in third place. He moved all in with pocket 10’s, which turned out to be a case of terrible timing for the 25-year-old. Chris Mitchell called the big bet and flipped over pocket A’s. The better hand held up, which removed Witcher from the tournament. Third place paid $81,702. 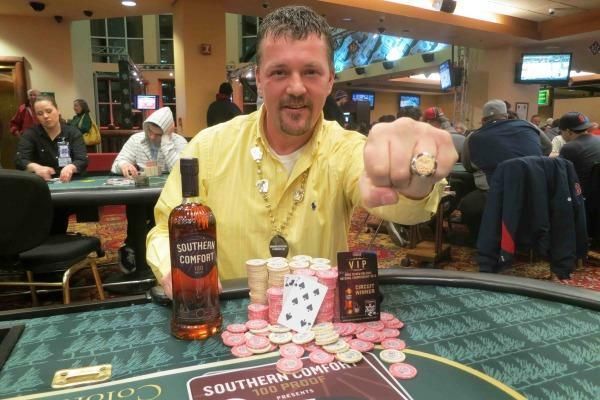 Chris Mitchell, a poker pro from Sumter, SC dominated this tournament over three full days. He held a dominant chip lead at the conclusion of Day One. By Day Two, Mitchell had increased his chip advantage to the point he was more than 2 to 1 over every other player that remained, except one. He also arrived at the final table with about one-third of the total chips in play. His runner up status and $138,894 in prize money for second place did not mask his disappointment with the final outcome. Mitchell suffered a serious of beats in the final stages of the tournament, and went card dead at the worst possible time. He ultimately lost his remaining chips when he missed an outside straight draw, which was topped by the champion’s two pair. When heads-up play began, the two survivors were close to even in chips. It took about three hours for the outcome to be decided. Video of the final hand of the tournament. First Place: Roland Isra Wins! Roland Isra, from New York, NY collected the $264,715 top prize, plus a seat into to the 2010 WSOP Main Event ($10,000 entry and expenses paid) to be held in Las Vegas in July.